July 21 is the 202nd day of the year(203rd in leap years) in the Gregorian calendar.There are 163 days remaining until the end of the year. Year 356 BC was a year of the pre-Julian Roman calendar. At the time, it was known as the Year of the Consulship of Ambustus and Laenas. The denomination 356 BC for this year has been used since the early medieval period, when the Anno Domini calendar era became the prevalent method in Europe for naming years. The Temple of Artemis or Artemision, also known less precisely as the Temple of Diana, was a Greek temple dedicated to an ancient, local form of the goddess Artemis. It was located in Ephesus. It was completely rebuilt three times, and in its final form was one of the Seven Wonders of the Ancient World. By 401 AD it had been ruined or destroyed. Only foundations and fragments of the last temple remain at the site. Ephesus was an ancient Greek city on the coast of Ionia, three kilometres southwest of present-day Selçuk in İzmir Province, Turkey. It was built in the 10th century BC on the site of the former Arzawan capital by Attic and Ionian Greek colonists. During the Classical Greek era it was one of the twelve cities of the Ionian League. The city flourished after it came under the control of the Roman Republic in 129 BC. Year 541 (DXLI) was a common year starting on Tuesday of the Julian calendar. At the time, it was known as the Year of the Consulship of Basilius without colleague. Basilius was the last person to be officially appointed Roman consul, since after this year, the office was permanently merged with the office of Roman/Byzantine emperor. Thus, from the next year forward, the consular year dating was abandoned. The denomination 541 for this year has been used since the early medieval period, when the Anno Domini calendar era became the prevalent method in Europe for naming years. Emperor Wen of Sui, personal name Yang Jian (楊堅), Xianbei name Puliuru Jian (普六茹堅), nickname Nryana, was the founder and first emperor of China's Sui Dynasty. He was a hard-working administrator and a micromanager. The Sui Shu records him as having withdrawn his favour from the Confucians, giving it to "the group advocating Xing-Ming and authoritarian government." As a Buddhist, he encouraged the spread of Buddhism through the state. He is regarded as one of the most important emperors in Chinese history, reunifying China in 589 after centuries of division since the fall of Western Jin Dynasty in 316. During his reign, the construction of the Grand Canal began. Year 1030 (MXXX) was a common year starting on Thursday of the Julian calendar. Year 658 (DCLVIII) was a common year starting on Monday of the Julian calendar. The denomination 658 for this year has been used since the early medieval period, when the Anno Domini calendar era became the prevalent method in Europe for naming years. Princess Anle (安樂公主), personal name Li Guo'er (李裹兒), was a princess of the Chinese dynasty Tang Dynasty. She was the youngest daughter of Emperor Zhongzong and his wife Empress Wei. Popular history holds that she was doted upon heavily by her parents and siblings, which contributed to her later drive for power. Carlos Duarte Costa was a Brazilian Roman Catholic bishop who became the founder of the Brazilian Catholic Apostolic Church, an independent Catholic church, and its international extension, which after his death became known as the Worldwide Communion of Catholic Apostolic National Churches. The Brazilian Catholic Apostolic Church is an independent Catholic church established in 1945 by excommunicated Brazilian Roman Catholic bishop Carlos Duarte Costa. 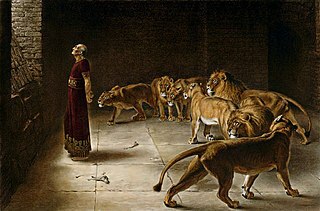 Daniel is the hero of the biblical Book of Daniel. A noble Jewish youth of Jerusalem, he is taken into captivity by Nebuchadnezzar of Babylon and serves the king and his successors with loyalty and ability until the time of the Persian conqueror Cyrus, all the while remaining true to the God of Israel. The consensus of modern scholars is that Daniel never existed, and the book is a cryptic allusion to the reign of the 2nd century BCE Greek king Antiochus IV Epiphanes. Saint Arbogast was a 7th-century missionary to the Frankish Empire and an early Bishop of Strasbourg. Barhadbesciabas is venerated as a Christian martyr who was decapitated during the reign of Shapur II. A deacon of Arbela, in the Sassanid Empire, he was arrested by the governor of Arbela, Sapor Tamaspor, and put on the rack. November 24 is the 328th day of the year in the Gregorian calendar. There are 37 days remaining until the end of the year. ↑ Previté Orton, p. 337. The Gest Berengarii and Constantine Porphyrogenitus' De administrando imperio both show Berengar as declaiming responsibility for Louis's blinding. ↑ Champagne, Duane (2001). The Native North American Almanac. Farmington Hills, MI: Gale Group. p. 75. ISBN 0787616559. ↑ "Alene Duerk". Newsday Entertainment/Celebrities. 2018-08-10. Wikimedia Commons has media related to July 21 .